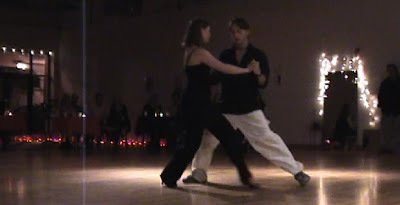 Then there's the idea that Tango itself promotes social good -- patience, tolerance, community and connection. It's all about connection -- to the music, to the floor of people, to the people off the floor, to your partner, to the earth. It's an astoundingly holistic exercise. We knew this, when Olga & I started the Tango Center as a community project. The reality of the project, impressed Tango instructors from around the world, who had not seen this exact kind of thing before. But Tango instructors, although generally a missionary bunch, are not really social activists. Well, some are. One of them is the extraordinary young dancer above, Jaimes, who feels he should be doing more with his tango to help the world. He's coming to visit in a few days, and we're going to try to put together a plan to create non-profit Tango Centers around the planet. I'm always very charged by people who want to do good. In this case, Jaimes, on a moment-by-moment basis, does bring quite a lot of joy to people. But the normal "gig" for a teacher at his level is to travel around and spend a few days somewhere, teaching some sequestered dancers, who are rather private and mostly dance at house parties. He'd far prefer to spend a month in a community, and help them build a public dance center dedicated to Tango. I'm putting together an online toolkit, and a unique web operation, which I'll talk about later.